The ‘Settings’ tab will allow you to manage what groups belong to what landing pages. There are four sections in the settings tab. Instruction Message: This is the instruction message that displays on the top of the Chat Request Form. Group Mode:This section will allow you to display multiple groups on the “Chat Request Form” or to only have a single group option. Available Groups: This section will display the available groups that are from the ‘Agent Group” tab. Assigned Groups: This section will be the groups that you assign to your landing page. Go to the “Select Page to Edit” at the top of the browser and from the dropdown menu select your page to edit or create a New Page. To add groups to the ‘Assigned Groups’ section, simply click and drag the group from the ‘Available Groups’ section and drop it into the ‘Assigned Groups’ section. Click on the next to the group name and that group will be placed back into the ‘Available Groups’ section. Click on the button to save your landing page settings. Your landing page will instantly reflect the changes. ***Note: once you have saved your page settings, you will not be able to reload page back to the old layout. Click the button to reload your ‘Landing Page’ back to last saved state. All groups that were moved into the ‘Assigned Groups’ section will revert alphabetically back to the ‘Available Groups’ section. Please Note: You are not able to send chat requests from the preview window. 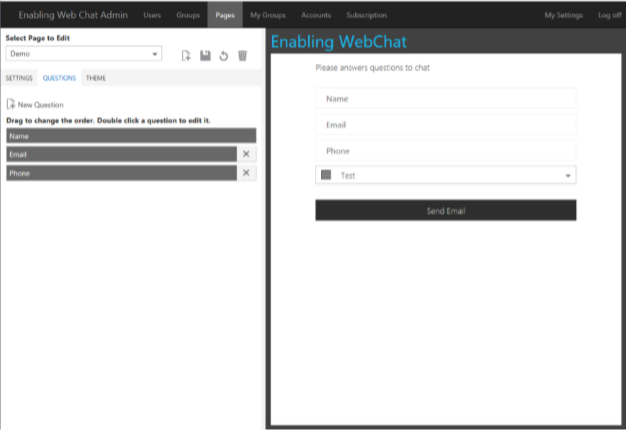 To test WebChat, you will need to enter the Webchat link into your browser. https://enablingchat.com/CompanyName/Pag eName. Replace Company Name with the company you sign in with. No Spaces. Replace Page name with whatever page you would like to display. By default, a “Demo” page is created.